We’re the Good Food Truck, and we serve up delicious savory waffle cones, light bites, international rice crispy treats, and much more throughout the Atlanta metro area. The Truck sort of found us – we saw it and instantly fell in love. Once we raised the money to fix it up, we set out to create a unique menu in easy-to-carry street food configurations, influenced by local Southern comfort food as well as Asian, Mexican, and Indian flavors. There’s also a healthy dose of whatever we think tastes good with fresh, seasonal ingredients from local farms. We share the love not only with the Truck, but we’ve also added the Trike, Watermelon Snow, Buffet and Tabletop Service. Now we can go almost anywhere! Follow / friend us on Twitter or Facebook to find out where we’ll be next. We hope to see you soon! Good Food Truck primarily caters. If you’d like us to sell at your event please contact us for our requirements. All prices are for 2 hours of serving time. A $750 min. purchase is required for the Truck and a $500 min. purchase is required for the Trike. Prices below do not include applicable sales tax or 18% gratuity which will be added to the invoice. Events which require a site visit will have an additional site visit fee. Disposable plates and utensils are included in the above prices. However, if you would like to provide your own china and glassware, a cleanup and recrating service is available for an additional fee. Menu options are likely to change as we are always in the kitchen creating new items and some ingredients are only available during certain seasons. We are also happy to create special menu items for your event to match your tastes, theme, or dietary needs. Parmesan cone filled with warm Italian style lentils, roasted butternut squash & rice. Served with a variety of butters (examples: edible flower, watercress, fig) & house made local jellies. Plus sweets like candied nuts, dark chocolate, cookies & popcorn. An assortment of meats, cheeses, house made jams, pickles, crackers, seasonal dips & veggies. ACCOLADES FOR WATERMELON SNOW ON SCOUTMOB! 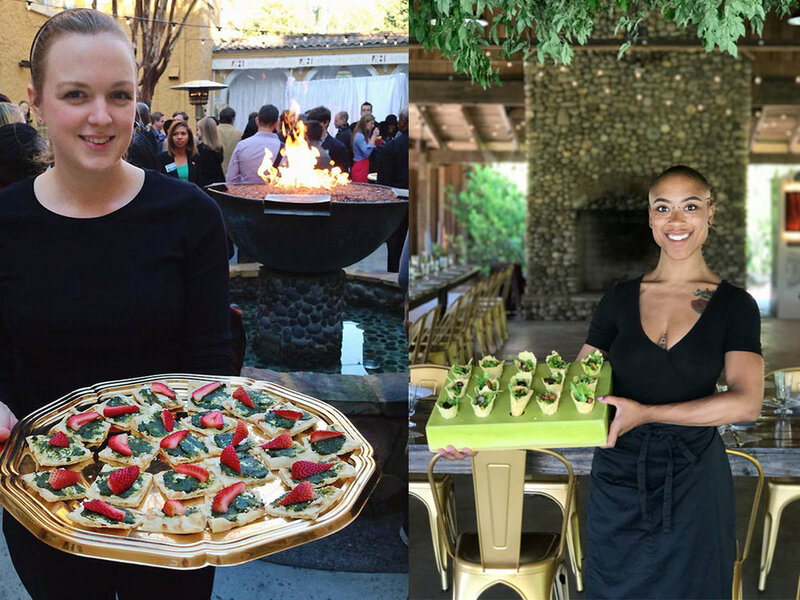 Let us create a custom menu for your event! This video is part of ArtsATL’s Creative Juices, a series exploring the ideas and inspirations that drive six metro Atlanta artists. It features artist George Long and Jessamine Star, his spouse and business partner, who have applied their creativity to the offerings of their Good Food Truck, a fixture at local arts events. Featured in Atlanta Magazine's Five Faves! Somehow, inside a cramped little mobile kitchen, the flavors of India, Thailand, Mexico, Italy and the South come together in serene harmony. Stuffed inside crisp cones and smothered over hoe cakes, the offerings of the Good Food Truck defy the cliché of fusion and move beyond into something, well ... really good.